Outdated digital signature by Mojang for "MinecraftInstaller.msi"
The digital signature of the Minecraft Windows installer (https://launcher.mojang.com/download/MinecraftInstaller.msi) is outdated. 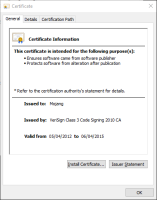 The signature by Mojang was only valid until 6th April 2015. MCL-4883 Outdated digital signature by Mojang for "Minecraft.exe"